A simple and secure heavy-duty wooden pet gate that permits passage by simply lifting 3/4" and swining the gate to open it.Â When mounted on a wall corner, a full 270 degree swing is possible.Â The gate can easily be removed from it's mounts in less than 3 seconds. It mounts to a wall in a home or office door or hallway, and has no bar extending across the opening to pose a trip hazard like pressure-fit swing gates.Â This makes it ideal for use near the top of stairs! 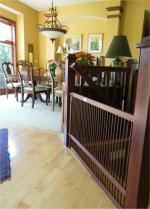 A simple and secure heavy-duty wooden pet gate that permits passage by simply lifting the gate to remove it and pressing it down to reinstall it. It pressure-fits a home or office door or hallway, and has no bar extending across the opening to pose a trip hazard like many other pressure-fit gates. This makes it ideal for use near the top of stairs!